 Master Chef Appliance Center is conveniently located on Lake Mary Blvd. less than 3/4 miles east of I-4 in the Lake Mary Village Shopping Center. While visiting our showroom, you may want to stroll some of the great shops and restaurants within our plaza. Master Chef Appliance Center is located in the West facing side of the plaza between Blockbuster and Homegoods. Orlando, Winter Park, College Park, Maitland, Sanford, Lake Forest, Daytona Beach, Port Orange, New Smyrna, Deland, and many more.